Description: The Bythrin are short, like seven year old human kids. They have tough purple skin with dark purple spots. Tall sprouts of light blue hair stick out from the tops and sides of their heads. 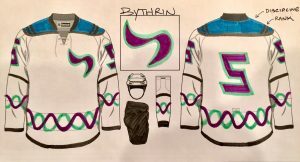 The Bythrin are famous for wearing hockey jersey uniforms, with shoulders of different colors to mark their job in the Bythrin Dominion. Culture: The Bythrin evolved on an ice planet. They quickly became masters of ice, learning how to control it in all sorts of ways. But they never thought of playing a game on it. When they discovered the wormhole to the Milky Way Galaxy, and Earth, they watched TV broadcasts and fell in love with hockey. They are responsible for spreading the game throughout the universe. 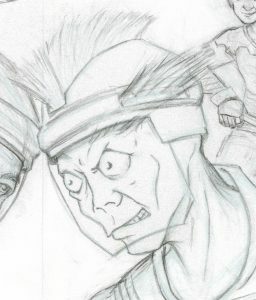 Scouting Report: The Bythrin are well-trained, balanced hockey players. They are athletic skaters, accurate passers and have quick shots. Every Bythrin must attend a hockey academy, where they learn to play with a similar style. This helps Bythrin hockey teams play with great systems and develop powerful strategies to defeat every opponent. Fun Fact: The BPHL (Bythrin Professional Hockey League) has 10,304 teams across all the planets in the Bythrin Dominion. 4,096 teams make the playoffs, which last for an entire Earth year.